- Experience the massively popular world of "Baldur's Gate" as never before. - "Baldur's Gate: Dark Alliance" thrusts you into an epic adventure filled with intense action, intricate puzzles and sinister intrigue; where your mastery of cold steel and devastating spells is the only thing between you and ultimate evil. - Hack and slash your way through more than 40 action-packed levels. - Battle over 35 vicious creatures including Gelatinous Cubes, Frost Giants and Dragons. - Play 1 of the 3 amazing Heroes, each with unique powers, appearances and skills. -Incredible single or two-player cooperative play. - Customize your character to gain new attacks and abilities. - Produced by the award-winning Black Isle Studios and developed by Snowblind Studios using the 3rd Edition Dungeons & Dragons rule set. 01-29-2014 scott Box Text *A New Legacy Begins* - Experience the massively popular world of "Baldur's Gate" as never before. - "Baldur's Gate: Dark Alliance" thrusts you into an epic adventure filled with intense action, intricate puzzles and sinister intrigue; where your mastery of cold steel and devastating spells is the only thing between you and ultimate evil. - Hack and slash your way through more than 40 action-packed levels. - Battle over 35 vicious creatures including Gelatinous Cubes, Frost Giants and Dragons. - Play 1 of the 3 amazing Heroes, each with unique powers, appearances and skills. -Incredible single or two-player cooperative play. - Customize your character to gain new attacks and abilities. - Produced by the award-winning Black Isle Studios and developed by Snowblind Studios using the 3rd Edition Dungeons & Dragons rule set. 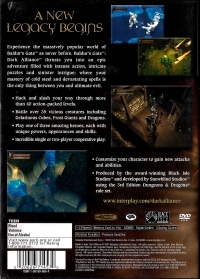 05-29-2012 disgaeniac Box Text *A New Legacy Begins* - Experience the massively popular world of "Baldur's Gate" as never before. - "Baldur's Gate: Dark Alliance" thrusts you into an epic adventure filled with intense action, intricate puzzles and sinister intrigue; where your mastery of cold steel and devastating spells is the only thing between you and ultimate evil. - Hack and slash your way through more than 40 action-packed levels. - Battle over 35 vicious creatures including Gelatinous Cubes, Frost Giants and Dragons. - Play 1 of the 3 amazing Heroes, each with unique powers, appearances and skills. This is a list of VGCollect users who have Baldur's Gate: Dark Alliance in their Collection. 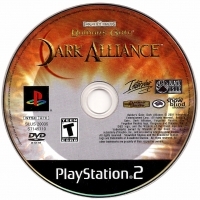 This is a list of VGCollect users who have Baldur's Gate: Dark Alliance in their Sell List. 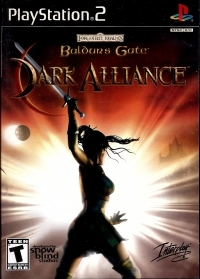 This is a list of VGCollect users who have Baldur's Gate: Dark Alliance in their Wish List.